Indian SUV market is growing with a rapid pace and at very large scale but the question is not only about growing but being very -very competitive. Every new dawn brings a new SUV in the market, gives another option for the customers. The thing that differs one from other is the innovation in the product (SUV market). From Chevrolet to Renault, Maruti to Ford, each top-notch automobile maker is in the race of becoming the No. 1 in the SUV segment now a day. So to give another option for customers Ford has launched it’s much awaited SUV in comparison to Chevrolet Enjoy, Tavera, Renault Duster and Maruti Ertiga. 30,000 customers in just 17 days, the figures are close to Honda Amaze and Mercedes Benz A class on their launch. 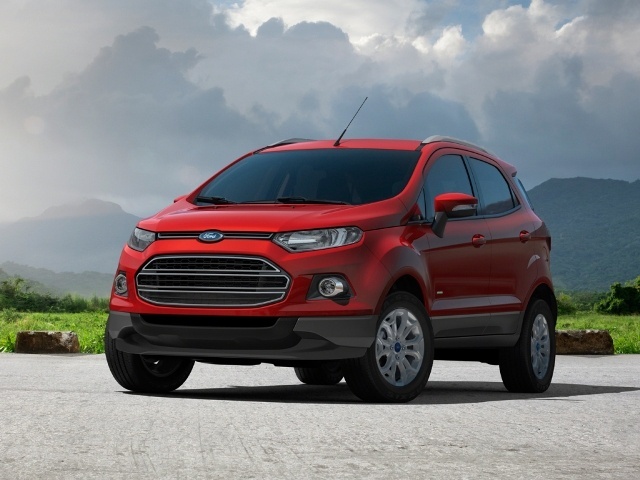 These figures belong to none other than the new stylish compact SUV FORD ECOSPORT, trendy machine with cool looks, design, concept and moreover the attraction which hits million eyes worldwide as well as on the roads. Before going in detail let’s take an overview of this mean machine: which is already creating ripples in the mind of consumers who love buying such fast machines. With 200 mm ground clearance, this urban SUV, makes your ride comfortable without being interrupted from ditches, bad roads , holes etc and in addition of 550 mm of water wading. Park your machine anywhere you want because city sized design makes it easy to park around the crowded city. With higher seating you have the option of looking around while driving. Talking in terms of its design, ford hasn’t changed much and has followed the kinetic design philosophy. The overall design is very appealing, aggressive, attention seeker and much more with a lot of chrome. Interiors of the Ecosport is themed with black and silver combination same as other ford cars. Ford has launched six variants of Ecosport that includes ambient 1.5 Ti –VCT trend, ambient, titanium, with petrol and diesel versions. Having displacement of 1499 cc with power of 109 bhp@6300 rpm this machine gives you an average of 15.8 kmpl. With 5 gears and 4 inline cylinders Ecosport has 52 litres of tank capacity. Starting from Rs 5, 68,909 ex showroom price, the car has different showroom prices according to the variants offered. Ecosport was one of the highly awaited vehicles of the 2013 and has finally made it to the grounds. So why wait, take a test drive and get a car home. This entry was posted in Auto, Delhi/NCR, Education, Generation Y, Indian Travel, Jazz, Opinion, Sports and tagged Chevrolet, Dacia Duster, Ecosport, Ford, Ford EcoSport, Ford Motor Company, India, Sport utility vehicle on July 27, 2013 by missionsharingknowledge.